I have always loved to cook and try new recipes. My wife, Jamie, loves when I cook for her and the family because it gives her some free time. Jamie told me that I am a better cook than her and that I should be cooking dinner every night. 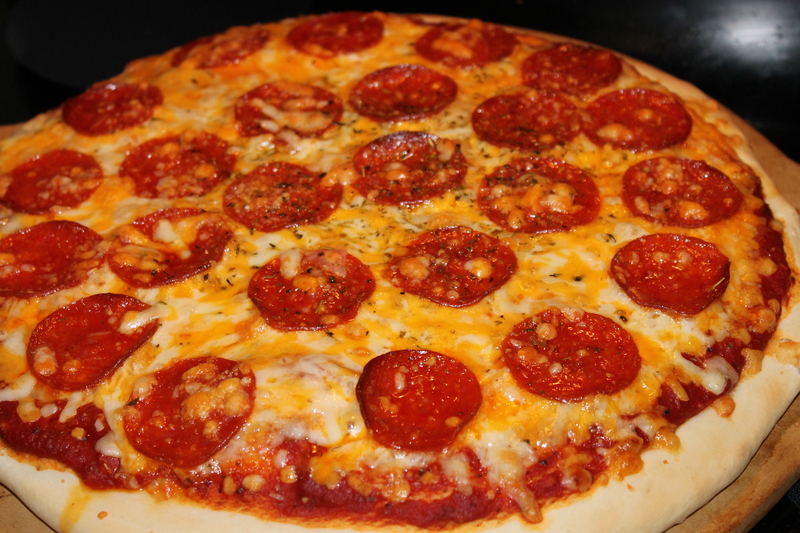 I want to share a pizza recipe that I love to cook when I get the chance. Here is the pizza recipe. Turn dough out onto a lightly floured surface and pat or roll into a round. Transfer crust to a lightly greased pizza pan or baker’s peel dusted with cornmeal. Spread with desired toppings and bake in preheated oven for 15 to 20 minutes, or until golden brown. Let baked pizza cool for 5 minutes before serving. If you don’t have pizza sauce, I have a good recipe that is really good. This entry was posted in Recipes and tagged Baking, Cooking, Pizza. Holy cow!! You make your own crust too! Your pizza looks better than some I buy out. No wonder Jamie wants you to cook for her. Wow! This is awesome! I love that you make your own crust. I need to start making my own pizzas since I eat pizza all the time. This recipe looks delicious! Your pizza looks delicious. You must make them more often for your family. wow..that looks and sounds delicious!! would be a big hit in my house that’s for sure! The best part about making the crust is that it only takes 15 to 20 minutes to make. I’ve been wanting to try creating pizza at home and this recipe sounds delicious!